With about 50,000 fans filling Papa John’s Stadium in Louisville, this wasn’t just another concert. This was U2, performing “The Joshua Tree” in its entirety. And it was great. 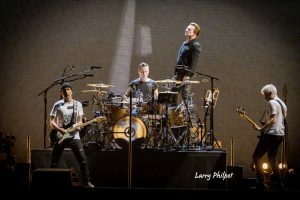 The Irish rock act — consisting of vocalist Bono, guitarist The Edge, bassist Adam Clayton and drummer Larry Mullen Jr. — definitely lives up to its own legend on this, The Joshua Tree Tour, which celebrates the 30th anniversary of U2’s most popular album. The group, which has utilized big props in their big arena performances, and hidden behind elaborate stage shows on many recent tours, took a stripped-down approach this time around and managed to make a concert for 50,000 feel surprisingly intimate, and welcoming. While this writer expected a political concert – and make no mistake, U2 does not shy away from political statements, this 30 year anniversary tour of “The Joshua Tree”, surely would be an activist event, reinforced by seeing actress Ashley Judd dancing just a few feet away from us. Some Joshua Tree songs, such as “Bullet the Blue Sky,” are inescapably politically charged. But it wasn’t. Instead, we saw a diplomatic, centrist Bono who reassured the massive crowd that whether right, left, or centrist, all were welcome. In an interview with Rolling Stone Magazine after the first concert of this tour, Bono told the interviewer that he wanted the people who voted for Trump to feel welcome. And, he made everyone feel welcome. Bono did dedicate “One Tree Hill” to all victims of gun violence, including Rep. Steve Scalise and Rep. Gabby Giffords. Giffords was also in the crowd. Thanking the audience for welcoming him and his Irish bandmates into our country and slipping subversive references to Trump’s “Build-That-Wall America” into the mesmerizing video that plays on a 200 x 45-foot cinematic screen, the largest light wall in Rock… behind the band. The 11 songs making up the 1987 album “The Joshua Tree” served as a centerpiece for U2’s first Kentucky concert in 16 years and its first Louisville show since 1982. Songs predating the album opened the concert, then the 11 song Joshua Tree in its entirety, and hits covering an 18-year stretch that followed the album concluded it. The two-hour show’s core, “The Joshua Tree” solidified U2’s superstar status three decades ago. 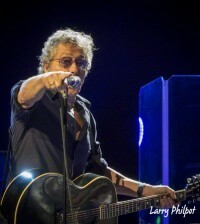 The first three songs on “The Joshua Tree” were the album’s biggest hits — “Where the Streets Have No Name,” “I Still Haven’t Found What I’m Looking For” and “With or Without You.” And the songs — encompassing such themes as spirituality, drug addiction, the plight of mine workers and politics in the Reagan/Thatcher era — sounded fresh and relevant, even though the band didn’t update them in any way. 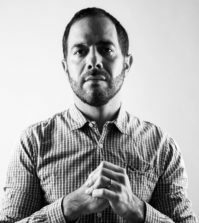 But by the time the band got to the second half of the album (“Welcome to Side Two,” Bono announced), the audience was faced with far less recognizable material, but old school fans rejoiced. 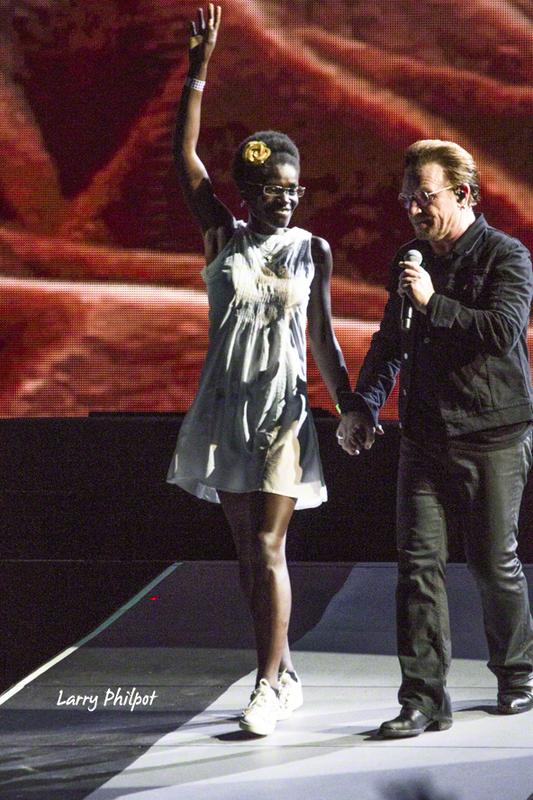 Of course, Bono delivered a few preachy/political messages, but they never really distracted from the music. It was just Bono being Bono, using his position to try and further the things he believes in. 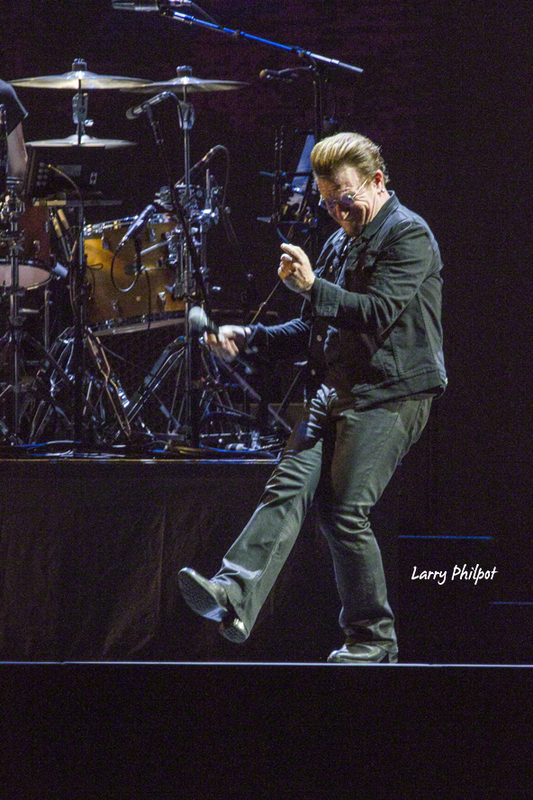 The band was energetic, and Bono, who suffered a herniated disc and back surgery in 2010, leading to the cancelation of the 2010 North American Tour, seems to be completely healed. The “Joshua Tree” performance — like the album itself — concluded on a tender note with the slow “Mothers of the Disappeared.” This song is sad. It’s slow, and certainly not what you’d expect as a close out song, but the band left the stage. People who do not attend concerts very often seemed disappointed, thinking the show was over. But no. 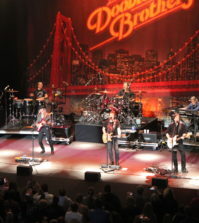 The encore featured “Elevation” and “Beautiful Day”, and left the audience with feel good state of mind. 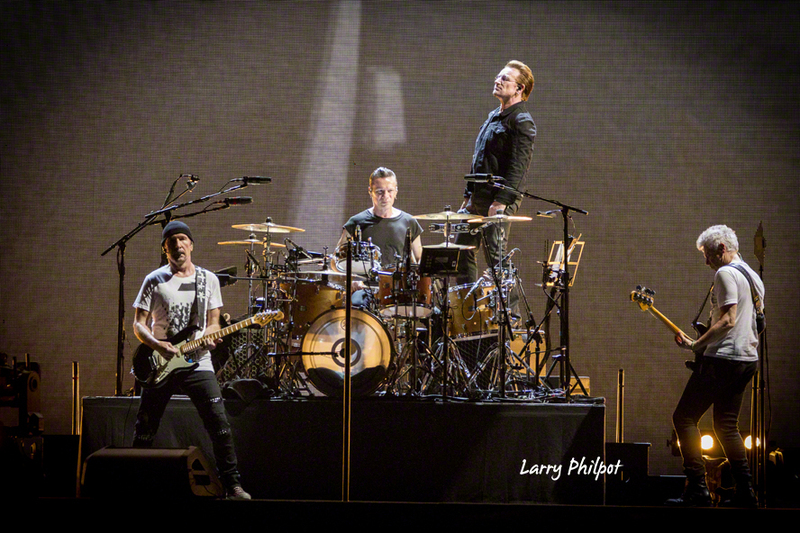 Generally, an outdoor festival or concert atmosphere is not the best place for the sound of a concert, but U2’s production team transformed a football field into a crisp sounding concert hall. Bravo! 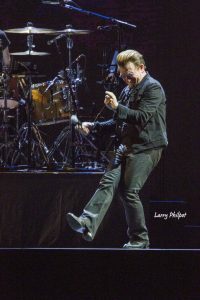 NEW YORK, NY (Thursday, July 6th, 2017) – Having played to more than one million fans, the first North American leg of U2’s The Joshua Tree Tour 2017 came to a triumphant close July 1st at the FirstEnergy Stadium in Cleveland. With ticket sales surpassing 2.4 million across North and South America, the UK and Europe, and Mexico, The Joshua Tree Tour 2017 has reaffirmed its standing as the most commercially and critically successful tour of the year. U2’s The Joshua Tree Tour 2017 heads to the UK and Europe where it kicks off with two nights in London on July 8th & 9th followed by concerts in Berlin, Rome, Barcelona, Dublin, Paris, Amsterdam and Brussels. 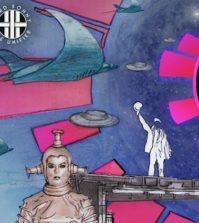 It will then relaunch in North America September 3rd with a return to Detroit – the city where U2 played its first ever headline stadium show back on April 30th, 1987 at the Silverdome on the original Joshua Tree Tour. The tour’s limited return to North America will include stops in Buffalo, Minneapolis, Indianapolis, Kansas City, New Orleans, St. Louis, Phoenix and San Diego. The tour will then head to Mexico City followed by concerts in Bogota, Buenos Aires, Santiago and Sao Paulo. Beck will be special guest for the upcoming North American dates. In Mexico and South America, Noel Gallagher’s High Flying Birds have been confirmed as special guest. U2 The Joshua Tree Tour 2017 is produced by Live Nation Global Touring. UPS is the Official Logistics Provider of the tour.